Over the weekend I actually made Chocolate Syrup! We love chocolate syrup around here, but I don't love that it has High Fructose Corn Syrup. There's some debate as to whether High Fructose Corn Syrup is no worse than any other sugar (the position primarily defended by the corn producers) or if it's truly a health danger. Personally, I fall into the second camp, and while I don't have a problem with regular corn syrup (it's been around for ages, our grandmothers and great-grandmothers used it), the high fructose stuff is something I try to avoid as much as possible. Regardless of the science involved, (TMI upcoming - you've been warned) I can tell you from personal experience that when I eat food with High Fructose Corn Syrup, I get cellulite. Within 12 hours of eating it. I'm shallow enough to avoid it for that reason alone, even without the obesity and diabetes links. I also don't trust artificial sweeteners, but that's a different topic for another day. Anyway, I found this recipe on the Internets, and cooked up a batch of chocolate syrup (seriously, it takes about 10 minutes). Caleb has approved it for both straight out of a spoon (for medicinal purposes, you understand) and in a chocolate milk application. He knows his chocolate, and he's a kid, so I think that qualifies his opinion in this case. I thought I'd share it with you since this is the time of year for ice cream sundaes. Enjoy! On that note, I've decided to take this week for lazing around with my little chocolate guy and since I'm between Camp Loopy projects and the cardigan is taking a time out, I'm going to put the blog on hold this week too. I'll be back, don't worry! All finished and blocked! 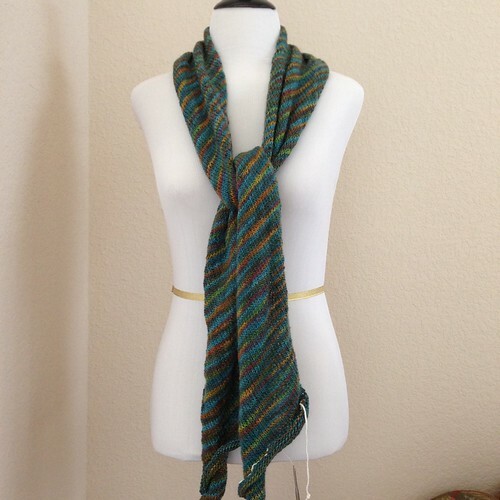 The pattern is the Bias Before and After Scarf, knit in Hand Maiden's Mini Maiden in Peacock. 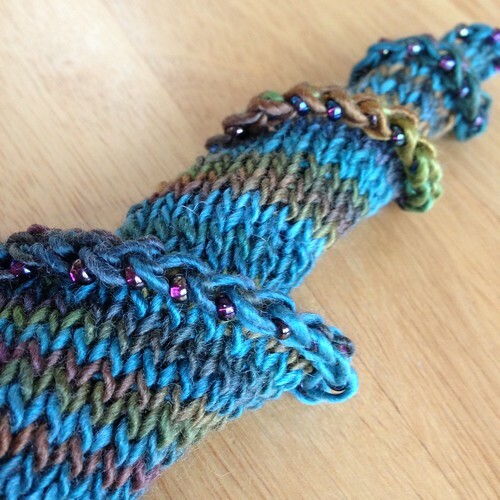 It's a super easy pattern, great for portable knitting or TV knitting. 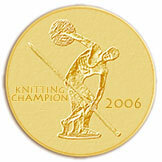 I could see knitting more of these! Here's a detail shot of the beading at the end. Of course we had to get a picture with Logan too. Max decided to photo bomb the first few shots. Then he moved aside and let Logan strike a pose. It's been a while since Logan had anything to model around here, but he still remembers what to do when you dress him up! 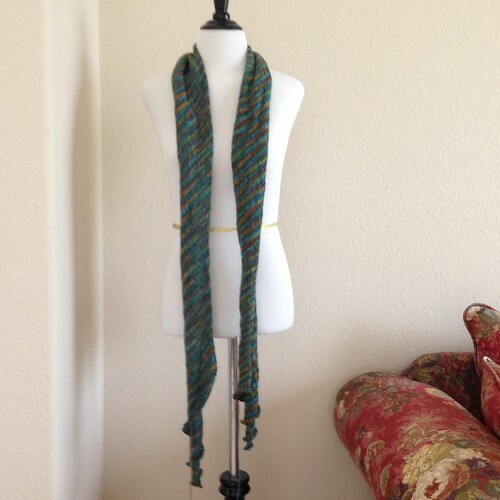 As you can see, the finished scarf will be long enough to wrap a couple of times around my neck. I'll measure it when I get it all blocked. 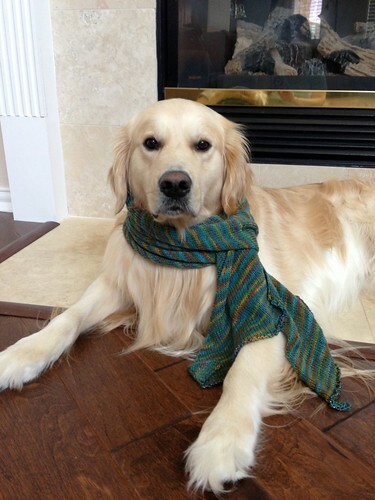 You know the cardigan I'm knitting? I'm working on the first sleeve? Well, now I'm not. 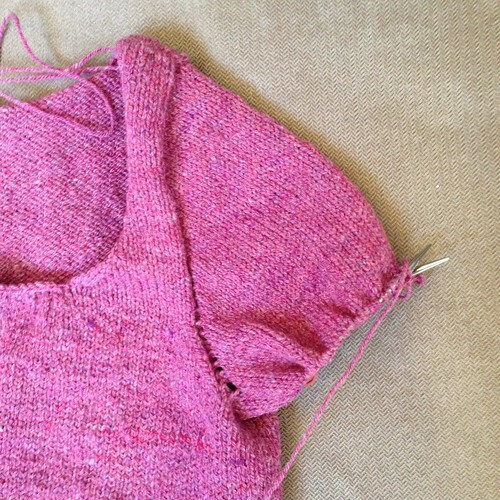 I'm going to frog the first sleeve because I'm not happy with my short rows. I think I did them the way I always did but I don't like the way they look. I've never had a problem with them before, so I might not be doing them the way I always did. I can't remember. Once I frog the sleeve, I'm going to put the whole project in Time Out. Not only do I need to read up on short rows, but I am just not motivated to work on the cardigan right now. So I'm not. It might be in Time Out for a week, or it could be for longer. I will finish the cardigan because I like it and I'm happy with the way it looks in my handspun, and I'm still liking the little apple blossom button. I just don't want to knit on it right now. This means I'm going to stop the Sweaters 2013 project too, since this cardigan is supposed to be finished by the end of the month. 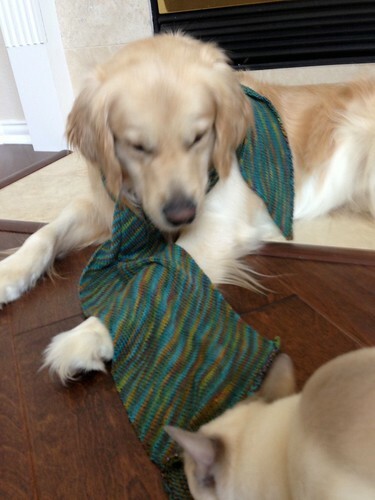 I love knitting sweaters, but I think I need a few smaller projects between them. I'll keep the stash yarns matched up with patterns - that will make things easier when I'm ready to knit sweaters again, but I'll do them when I'm ready to do them. Since I made the rules, I can change them, right? The scarf is almost finished! I'll keep going a little bit farther, but I'm past the 375 yard mark (by weight). 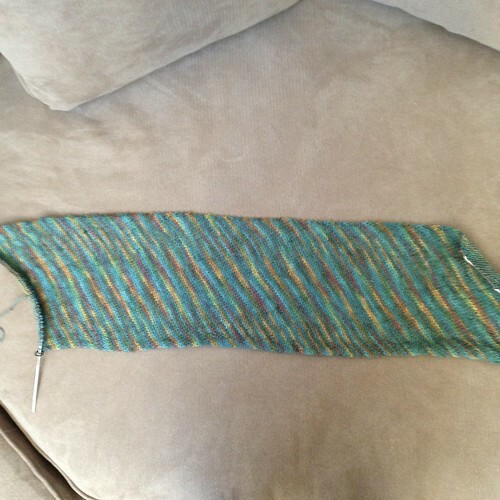 Then there's a beaded bind off at each end, blocking and done! So far I haven't hit a stockinette wall, but I've also only knit on this in front of the TV and around other people, when things are going on. It might have been different if I was knitting this quietly. I think I've chosen my project for Project 2, but I'm not going to share yet - just in case I change my mind between now and July 1. 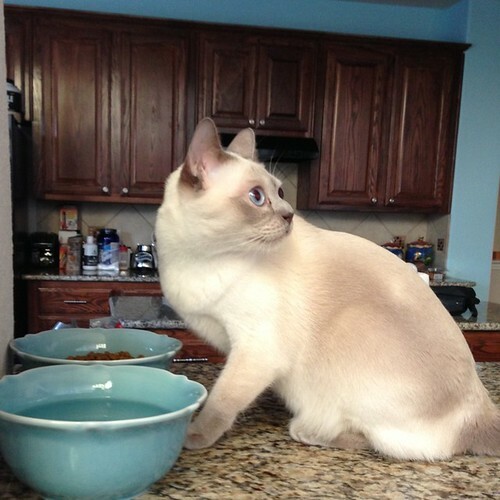 In the meantime, Max seems to have completely adjusted to his new food location - he had a good weekend and didn't give me any more drama. Camp Loopy 2013 Project 2 has been announced! My yarn has been ordered but I'm still trying to figure out my project. I got lost in Ravelry yesterday and got no knitting done. I need to finish my first project (and also the cardigan that I'm supposed to be working on, and Mickael's socks, and hexipuffs, and...). Well, you get the point. I made it past the sleeve cap this weekend and now I'm going round and round and round! I'm using my little 9 inch long circular for the sleeve because it's faster than double points. I know that not everyone likes this size for a circular needle (the actual needle parts of the needle are only a couple of inches long), but it works just fine for my hands and the way I knit. I don't like to purl with this size of needle. At all. 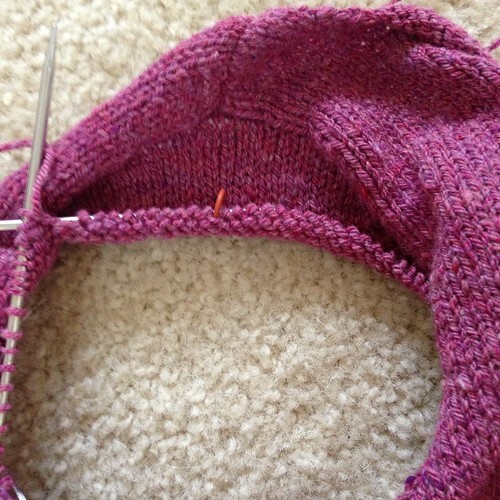 When I get the sleeve knitted and it's time to do the lower ribbing, I'll switch to double points. I need more needle to grip or something when I purl and these little circulars just don't work. This means that I will have used three different needle types/sets on this sleeve when I get it done: the long circular I used for the short row section, the 9 inch circular, and the double point set. I remember when I first started knitting and I thought one type of needle (in all the sizes) would work. Now I know that not only do I need lots of different types of needles, I need them in several different materials too because different yarns work better on different needles. Of course I also need lots of different needles so I can work on several different projects at once. Is there ever a point where you have all the needles you need? I've been working right along on my Camp Loopy project! I'm estimating that I'm about 1/3 of the way through my skein of yarn. 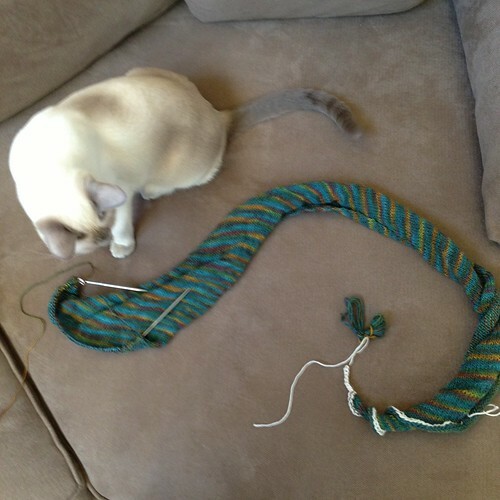 The pattern wasn't kidding when they mention that this project looks strange while you're knitting it. 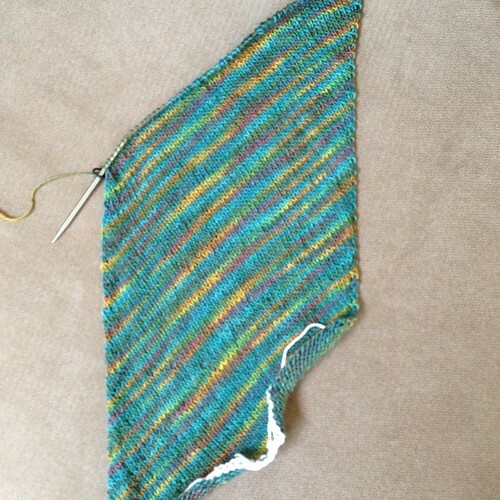 You wouldn't think blocking would make that much of a difference on stockinette, but I think it will. For now though, it's just a misshapen, long blob. Oh, and I was able to get the colors better on this photo - it's not quite as bright as the photo the other day! Yesterday there were a couple of questions in the comments, and I thought I'd answer them here, but also share a few more things! I found my button for my cardigan at this Etsy shop. She mostly sells beads, but I found her when I was doing an Etsy-wide search for pewter buttons. Shipping was fast and everything arrived nicely packaged! A few weeks ago, I mentioned and/or linked to this little zipper container. 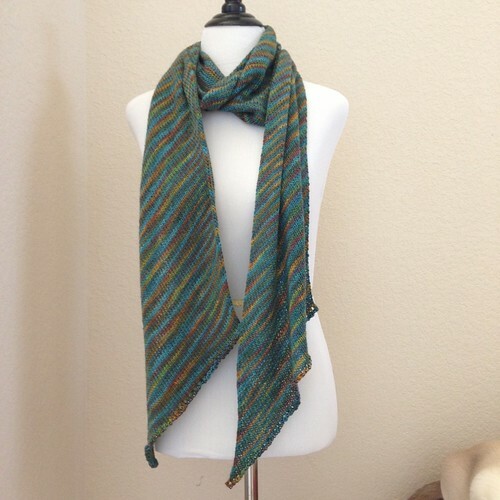 The pattern and tutorial are free at the link. It was designed to corral hand sewing things, but I think could easily be adapted to hold a pair of socks in progress. I haven't made it, but I think I might tackle it this summer. When I went to find that tutorial, I ran across some other free sewing tutorials (seeing as I was in the "Tutorials, Sewing" section of my highly organized, slightly OCD Safari bookmarks), so I thought I'd share some of these with you. I've gotten positive comments about my sewing adventures and some of you seem inclined to get out your own sewing machines for some easy projects, so maybe one of these will inspire you! The Dumpling Zipper pouch is super cute and could probably be resized to fit any number of uses (I think, I haven't made it yet). The tutorial notes that the curve on the zipper makes this an intermediate sewing project, so don't jump into this one if you're a beginner or your skills are rusty. If you're looking for a larger bag (you know to corral all your smaller bags, or whatever else needs corralling), the Parisian Market Bag from Red Brolly is really cute, and with the pleats it's a little more fun than just a standard tote (not that there's anything wrong with a standard tote, of course). Red Brolly has a bunch of free tutorials so check those out too, while you're there! Also in the bigger bag category is the Reversible Sling Bag, which I made in the elephant print a few weeks ago. Super easy, super fast and really cute! This was my Getting to Know The Treadle Machine Project and she sailed through it with ease. I added a pocket on the front side to mine, but it's cute with or without the pocket. I don't think this would be a good first project for a beginner, but if your skills are just rusty, it could be a great way to jump back into sewing. If you are a beginner, a great place to start making bags would be to check out Craftsy. They have two free mini classes with two bag designs each (that's four bags total!). The Bag Making Basics: Drawstring Bag and Bucket Bag class is the place I got my drawstring bag pattern (super easy - this one would be a good first project). I haven't made the bucket bag yet. The other one is Bag Making Basics: Reversible Tote and Zipper Pouch. I haven't made either of these yet, but the zipper pouch would introduce you to zippers. For some reason zippers freak people out, so if you try them when you're just getting started sewing, you will see that they aren't that scary. Zippers are our friends! Either of these classes would be a great starting place because you can watch the videos as many times as you want to, rewinding confusing bits over and over and over in the privacy of your own home. You can work as quickly or as slowly as you'd like to but in the end you'll have a cute bag! There is also an add-on to the Zipper Pouch above: the teacher has four additional sizes figured out! Once you understand the basic construction, you can make zipper pouches for anything that needs zipping! Finally, I wanted to share one other place that is loaded with free tutorials and patterns - Sew 4 Home. Sew 4 Home covers pretty much any project except clothes. They have bags, gifts, blankets, pillows, outdoor stuff, indoor stuff, car stuff - all kinds of things. Take a look at their tutorials, you could be busy for years! There are other tutorials and free patterns and things on the web, but these are my current favorite sources. Check them out, bookmark the ones that interest you, and if you find something that I didn't mention, feel free to link it in the comments so we can all check it out! I started the first sleeve to my cardigan yesterday. These are knit in, from the top down. I love not having to finish anything when I'm done on these kinds of designs, but I don't really love the short rows part to get the sleeve cap knitted. I should have been twice as far as I am, but I didn't read the directions right and had to start over (so. much. fun.) I'm now back to where I was though, so hopefully everything will move forward now. I also got my button for this sweater. It looks tiny to me, but this is the size the pattern calls for, and since I chose the little apple blossom flower, I think tiny will be nice. I don't want it to look like a kid's sweater, but I think since there's only one button, I should be OK. Also, it's pewter, not plastic, so that makes in a little more grown up too. 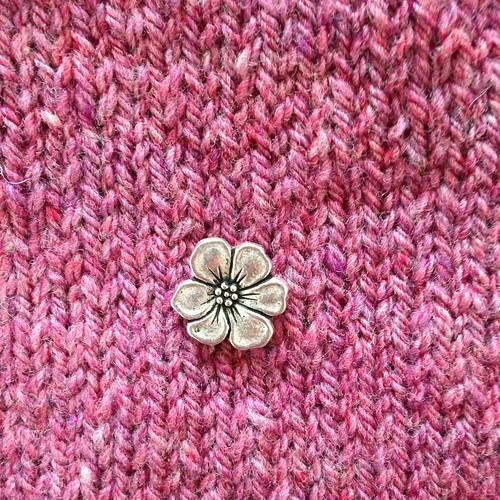 Alright, clearly while I love this button, if it looks too cutsie, it will be replaced, but I won't know until the sweater's done and I can try it on. My initial gut reaction was that this was the right button for the sweater, and my gut's usually right. I have no idea why I'm waffling about it this morning when I haven't had any caffeine yet, and I haven't sewn it to the finished sweater. I'll go drink some tea now, you have a lovely day doing whatever you do, and we'll pick up this button discussion later. Saturday was June 1, which is the official kick off, cast on, get started day for Camp Loopy! I decided to do the Bias Before and After Scarf because I need easy, autopilot knitting this month. You start with a provisional cast on so you can put beads on each end with a bind off (which is why there's all that white cotton yarn showing). 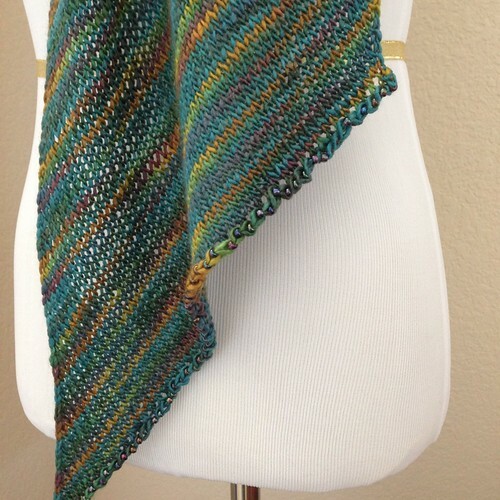 My yarn is Hand Maiden's Mini Maiden in Peacock, and I'm liking the way the colors are striping on the bias. I could tell this was moving along nicely, but I had no idea how much I had finished until I spread it out this morning for the photo - always a nice surprise!